President-Hotel is located on the picturesque bank of the Moskva River in administrative, business and trade center of Moscow. 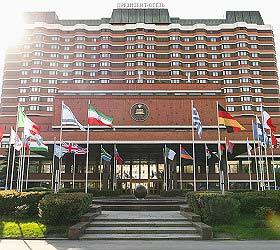 Designated to provide the necessary conditions for reception of foreign official delegations, today the hotel is one of the main players on the business tourist market. From the top floors of the hotel there is a beautiful view of the center of the city, the bank of the Moskva River, Peter the Great monument, Christ the Saviour Cathedral, Bolshaya Yakimanka Street leading directly to the Kremlin. The remarkable interior of the rooms and panoramic view of Moscow are frequently used by Russian and foreign film directors in their films about Moscow. In 208 comfortable rooms of the hotel up to 350 guests can be accommodated. Each room has a bath, telephone, satellite TV, safe deposit box and other modern amenities. The hotel offers the following services: business centre, excursion office, souvenir boutique, jeweler's, sauna, jacuzzi, fitness centre, massage, dry cleaning and laundry services, post office, pharmacy, medical centre, railway and air ticket offices, guarded parking. The range of provided services is constantly expanded. President-Hotel has 20 individually designed halls with unique interior and advanced technical equipment. More than 2000 participants can be accommodated in these halls at one time. The sound amplifier and simultaneous translation Media Matrix system, which has analogs only in a few foreign hotels, give an opportunity to hold high-level meetings, conferences, symposia.